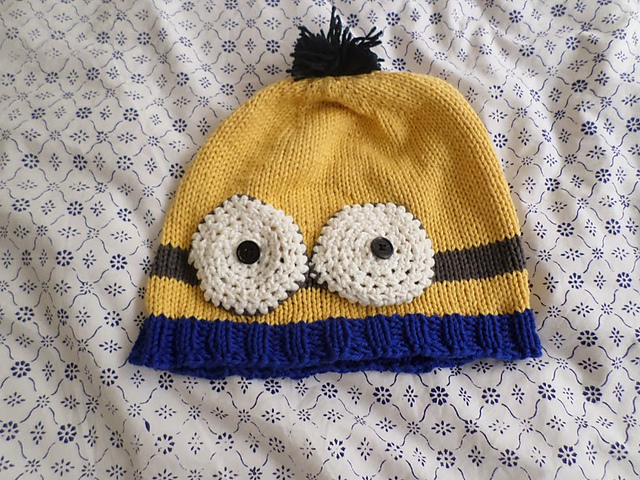 Most of my minions tend to have only one eye, but by request my second minion hat has two eyes. The requester? requestee? person who made the request had received a one-eyed minion hat and had gotten his grandmother hooked on “Minion Rush” over Hanukkah, so he asked that I make a two-eyed minion hat for her. I don’t know. For some reason minion-y things don’t look so minion-y with two eyes. I had the crown of a hat already knit that I was wondering how I would use from re-knitting the first hat. So when he mentioned I should make one for “Grammy”, I was already halfway done. Well, a third of the way done anyway. Project notes, as always, can be found on the Ravelry project page, but in general I used Knit Picks Comfy worsted weight yarn in Creme Brulee, White, Celestial, and Hawk, along with a miniscule amount of Knit Picks Stroll in Midnight for the pompom. The eyes are basic crochet circles with buttons sewn in the center for pupils.